I'm typically drawn to technical pursuits (brewing, coding) so it wasn't surprising when I took up sailing earlier this year. It started with just my own curiosity- I'd pore over books, forums, blogs, videos, and just about every other piece of information available on the topic. One thing I hadn't quite anticipated was just how slippery a slope it would become. I'd always wanted to buy a boat. I grew up on the water, and I spent my weekends on boats, snorkeling, jumping off rocks- enjoying all things water related. This interest in sailing, however, was a much more recent phenomenon - one which took me by surprise. I'd always viewed sailors as a crew of posers, who liked to tie up dockside attired head-to-toe in Helly Hansen, pint in hand, never daring venture beyond the breakwater. Turns out there was more to it than this misconception.. The idea of a form of propulsion that didn't cost several hundred dollars per hour to run is very appealing! Even more appealing is the skill involved in trimming a set of sails to glean optimal performance based on current wind direction, velocity, tides and current. It's a multi-dimensional, complex polynomial equation to be solved which takes a lifetime to perfect. Never did I think that zipping along at seven-and-a-half miles per hour could be so exhilarating .. 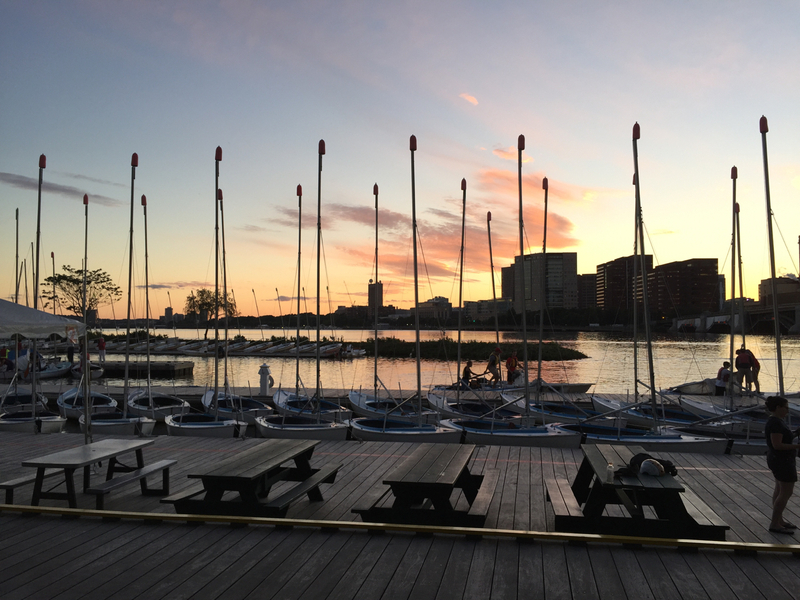 I started sailing at Community Boating on Boston's Charles River. For just $300/yr, I could take lessons & eventually sail their entire fleet. The season opens in April, when the frigid rivers of the Charles are incentive enough to avoid capsize. I joined first day, and between April and July I was sailing often 4 or 5 nights a week, graduating through their rating system. Eventually, I had the sufficient cajones to take out their larger boats, and in heavier wind conditions too. In parallel, I'd realised there was more to sailing than the Charles River Estuary - Boston Harbor has some of the best daysailing grounds in the United States. I'd applied to volunteer crew on racing boats on a number of boards, and eventually somebody took pity on me (thanks, Ryan!). I started crewing on a 26' Thunderbird, racing out of South Boston. Most courses saw us sailing in the lee of Thompson Island, and Boston Harbor turned out to be infinitely more exhilirating than the Charles River Basin. That was it - time to buy a boat! One: Interior accomodations were akin to a tent on the water. It'd be nice to be able to stand up! Two: We'd have nowhere to store a trailer. The cost of summer storage, and the pain that would be launching for every use would be alleviated by just keeping a boat in the water. Cost less than I'd sold my car for - because that way it was somehow an easier, more sensible purchase to justify. $11,000 was the budget. Along with this criteria list, I had a checklist of items to check assembled from a few self-survey resources online. A time consuming process, this checklist consisted of about 2 hours of poking & examining. I had every intention of having a professional survey performed - but I wanted to avoid this cost if I could identify "a lemon" (of which we encountered a few) before paying some $600 for a Survey. We ended up viewing 8 different boats, settling on a Catalina 30 - the only boat which had any standing headroom for my 6'3" frame. Compared to other boats of its size, it feels huge down below. While it's no bullet-proof blue water cruiser of the world's oceans, it suits our ambitions for the next few years just fine. I made an offer, the owner countered, and we eventually settled on a price. The boat was sitting on the hard at the owners house, so transport added both cost and stress - possibly why the boat hadn't sold despite being $5k below retail. The survey checked out, so I went ahead and arranged next-day transport for the boat 50 miles to the water south of Boston. 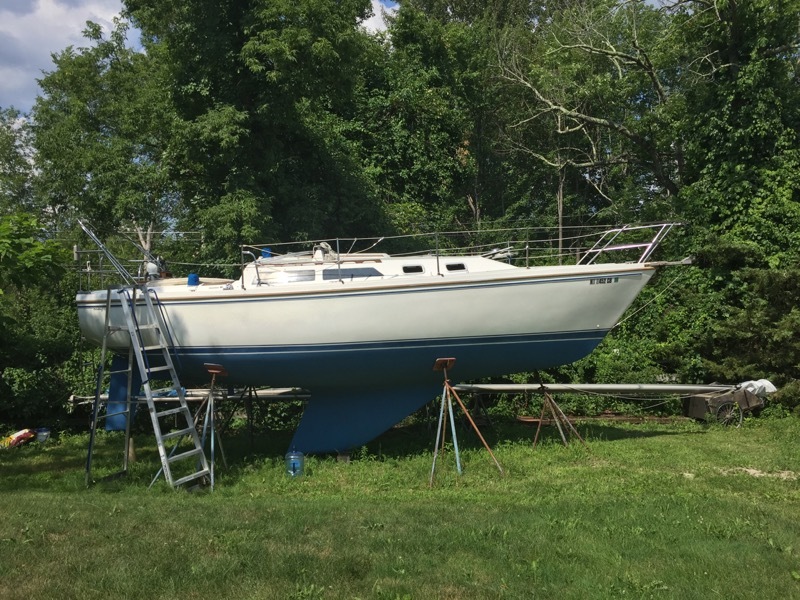 We launched, the boat didn't leak, and it spent a few days on a mooring at a South Shore yacht club before we sailed her back to Boston Harbor, where she now lives. Now, the fun part - as with most of my blog posts, I'm happy to be an open book on the financials, since it's an interesting insight for anybody considering doing similar. What did all this cost? So far, we've had a few glorious sunset sails through Boston Harbor. I've also already been kneck-deep in projects - in the past 2 weeks since launch, I've had to tackle mold, remove wasp nests, drain & clean both water tanks, fitted an engine breather hose, rewired the nav lights, and fixed the autopilot. 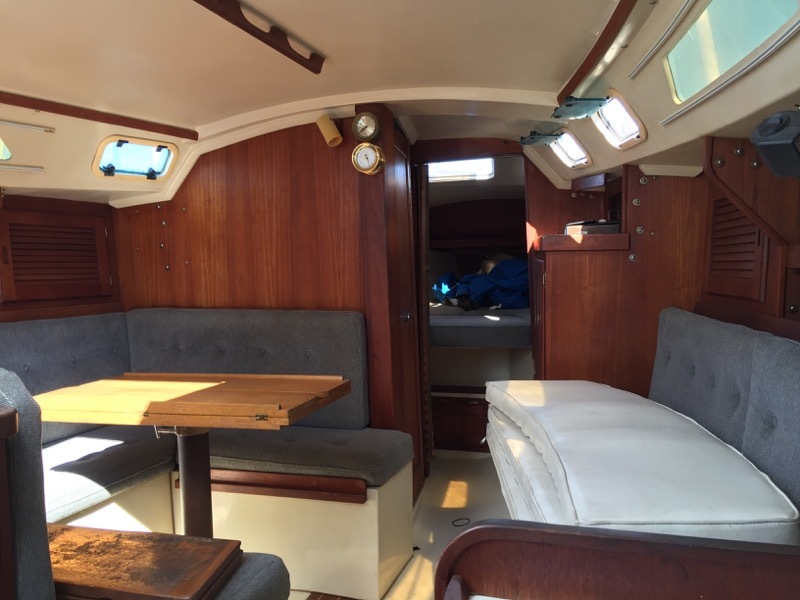 Hopefully before the 2016 season ends we'll get to spend a night or two on the boat. 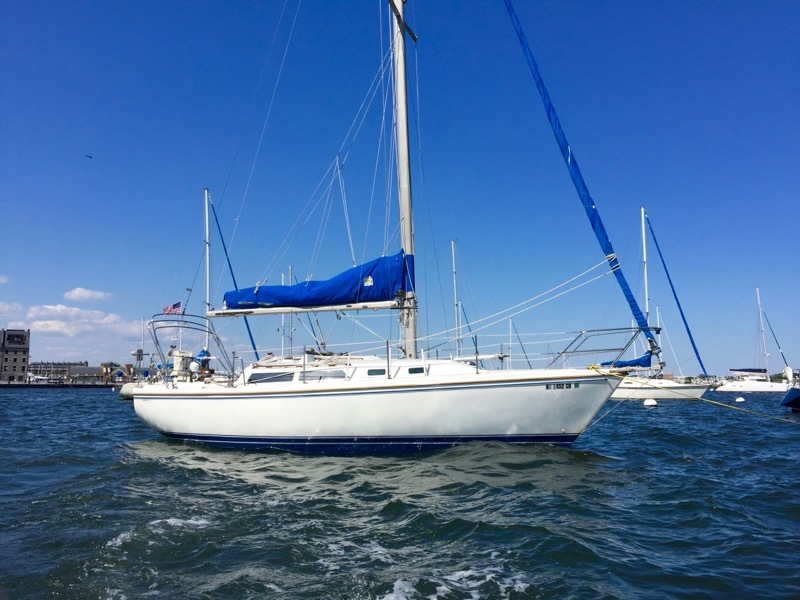 Right now, the stretch goal is a trip to Provincetown, a 6 to 8 hour sail from Boston to the tip of Cape Cod - but let's see how a night at the mooring goes first..
More on that as I have it!